Aharon Adler insisted on treating wounded policemen even after being shot in the leg. Aharon Adler was at home with his wife, when his MIRS emergency cellphone buzzed, updating him of a terror attack in progress at the Lion's Gate, next to the Temple Mount. As a 16-year veteran paramedic for Magen David Adom (MDA), he reacted instinctively, handing his baby daughter off to his wife and speeding off to the scene on his MDA-issued motorcyle. "As I was treating one of the injured policemen, the shooting erupted," Adler told Arutz Sheva. "The terrorist got up and tried to grab his weapon, and all the policemen started shooting at him. I was afraid that they would hit each other, and yelled at them to stop, until I suddenly felt a pain in my foot." Adler had been hit in the leg by a bullet. "I didn't realize at first that I was shot," he said. "I felt a pain in my leg, but I didn't put the pieces together." Other paramedics at the scene begged him to evacuate himself to the hospital, but Adler refused, vowing to continue treating the injured until they were fully taken care of. "As I saw it, I was only lightly wounded." recalled Adler. "There were other policemen more seriously wounded then me, and it did not seem right to waste a medic on me. I also felt that despite being shot, I was capable of treating others, so why stop?" Adler finished treating the wounded and was rushed off to Shaarei Tzedek Hospital, where the bullet was taken out of his leg. He says that his wife while worried for him, understands the importance of what he does. "She's worried," he acknowledged. "But it's not something that would cause her to ask me to do something else with myself." "As a first responder, you work as a team with your wife," continued Adler. "Even if she's not in the field, she is a part of things, when I have to drop everything, leave her with the kids, and just go. Its teamwork, and we know why we do it. The good that comes out of it makes it all worth it." 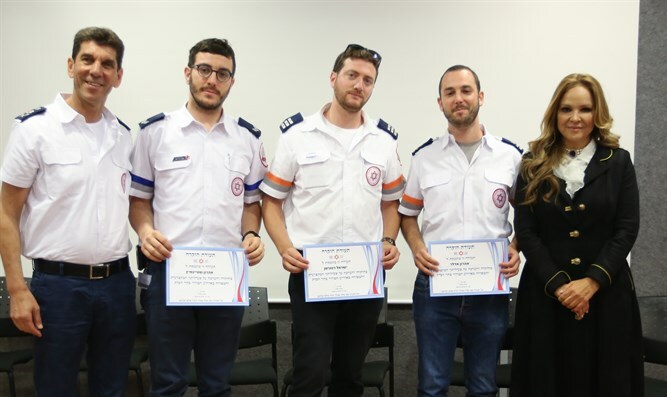 Adler's actions under fire did not go unnoticed, and he was officially recognized at a special ceremony Monday at MDA's Jerusalem headquarters honoring him and his fellow paramedics who treated the wounded policemen even while bullets flew by.